If you are going sidecar racing, you will know that the demands on the engine take it far beyond its design limits. Also, engines designed for solo motorcycle use rely on the lean angle of the bike to keep the oil in its appointed place while cornering. This doesn't happen when the engine is bolted to a sidecar outfit and held vertical at all times. To make sure that your engine has optimum lubrication at all times when racing, the answer is to fit a dry sump system. For many years now, we have been manufacturing our own systems to fit the popular choices of engine used in sidecar racing, like Kawasaki, Honda, Yamaha and Suzuki. The components are all built in our own workshops from components manufactured using the latest CNC equipment, and are tested to the limits in our own sidecar racing outfits. To keep your sidecar engine running at the limits as reliably as it possibly can, talk to us now about one of our dry sump systems. 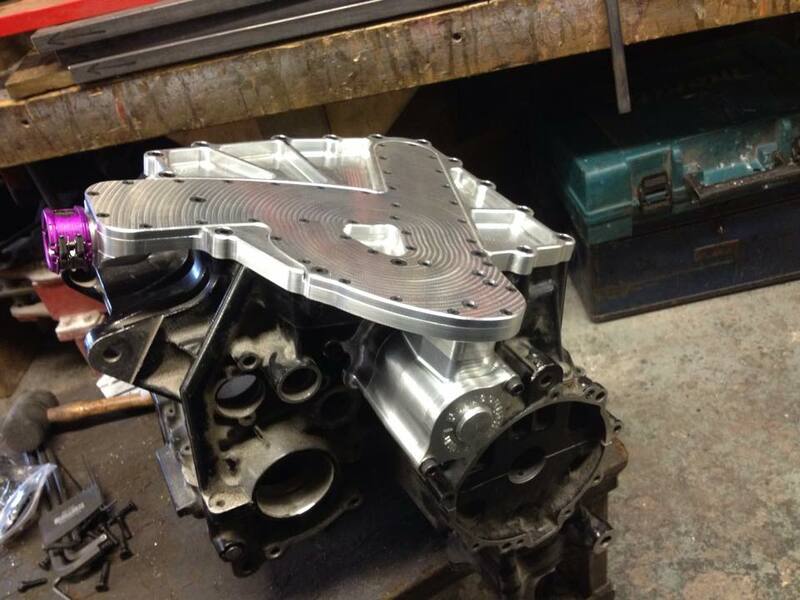 This is the latest cnc machined low level dry sump system Richard Lumley has designed. The challenge was to produce the thinnest sump and pump combination we could this one measures 15mm thick which will allow us to fit the engine 17mm lower in the chassis - Lower is always better !